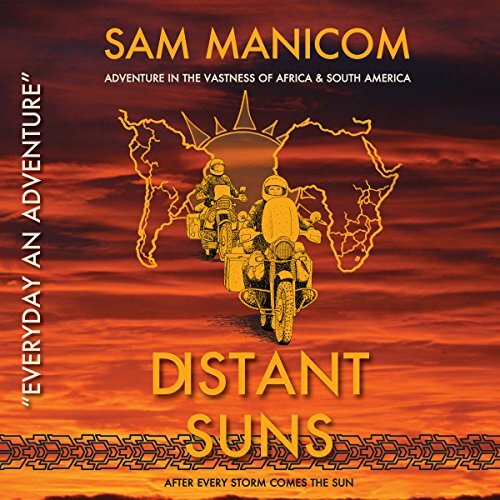 Sam Manicom's dynamic third book transports you to Southern Africa, South and Central America. Sam has a gift for describing the vibrancy of people and places, and you are led effortlessly through three very different parts of the world by his enthusiasm and his acute observations. Human behavior, drama, passion, disaster, humor, and the pure adrenaline buzz of overlanding such far-flung, wild and exotic places are all here. This thought-provoking mix is brought alive by both his descriptive, which can make the mouth water or the hairs on the back of the neck crawl, and the historical tidbits and cultural notes about the people and places he visits. Distant Suns highlights the joys of traveling with others and how, when you are with others, you often do and see things you otherwise may not have done; but also touches on the added stress that comes with traveling in groups - even small groups. Unlike his two previous books, Sam travels with a companion, Birgit, who you'll have met during the course of his previous book Under Asian Skies. Distant Suns is the story of how boy meets girl, both endowed with a mile-wide streak of wanderlust, and both fiercely independent, but learning to live together on the road, and saving each other's lives on occasion. Birgit catches your attention right away with her incredible initiative and capability with her bike. Yet, she'd only been riding a bike for 600 miles when they arrived in Kenya at the beginning of this journey. Sam and Birgit's adventures are never without peril, but the attitude they have is what makes them terrific world travelers. Over the course of three years, a lot of things can and do go wrong, but Sam and Birgit don't let any of them stop them from completing their journey. When Paul Theroux wrote, "Take the leap. Go as far as you can. Try staying out of touch. Become a stranger in a strange land," he could have been describing Distant Suns. Where does Distant Suns rank among all the audiobooks you’ve listened to so far? Distant Suns ranks in the top 10% of audiobooks I own. The book, on it's own, was quite interesting. The Audiobook is read by the author which brings it to life. I loved the descriptions that catapulted my imagination to the locations visited. Manicom has a remarkable gift of filling one's senses with the sights, sounds and smells of the region. Beyond the vivid settings, the story told of joys, struggles, hardship, fascination and reflection. This time, Sam is joined by his partner Birgit, whom he met in Australia. This romance which began in "Under Asian Skies" has evolved to include Birgit on her own bike. Overlooking Machu Picchu, there is a moment of reflection for Sam which resonated deeply with me. Several scenes described in this tale caused laughter. Most importanly, perhaps, "Distant Suns" left me in wonder and with a greater thirst to visit many of the locations described in this book. Like "Into Africa" and "Under Asian Skies," "Distant Suns" will fill your imagination with wonders from some amazing regions of our world. The dynamic of Sam and Birgit making the journey adds a unique and welcome perspective. This symmetry also fills one's hope of traveling with a partner on expeditions, near and far. Love Sam's travel books. I've listened to his others multiple times each. This is not just for folks that like motorcycle travel. Anyone who enjoys travel stories should enjoy this book as well. I really enjoy Sam's reading of the book. He has a very soothing voice that helps to make my long commutes in the car a lot more relaxing. I really like Sam Manicom's easy relaxed narration and writing style. It makes for a very enjoyable listen. Perfect for anyone who loves travel, or would love to travel. Amazingly descriptive, it feels like you are right there with Sam and Birgit as they face and overcome many challenges on their adventure. Whether you like motorbikes or not, you'll love this book! I love Sam. He's a great writer, a wonderful person and an excellent narrator. Listening to this you will wonder why anyone would travel to these places and experience the mass frustration he experienced. But at the same time you understand. He tells a wonderful tale and really draws you in as he explains things so perfectly. Be sure and listen/read his books in order lest you find yourself confused of what is going on. Lets you travel along without a motorbike. Fantastic. Beautifully written story of triumphs and tribulations. Sam's turn of phrase has the ability to really 'take you there'. Don't be put off by the motorcycle angle, this book is much more about the people and places than the bikes. A joy to listen to. Very good audible book for anyone who’s a motorcyclist enthusiast! I only wish the author gave more details of distances travelled and specific routes taken to let the listeners follow them via online maps. Great way to pass the weeks for us Northern Riders suffering from our annual PMS (Parked Motorcycle Syndrome)! I highly recommend this to anyone who loves adventures, Travels and Motorcycles. Sam has another home run. Great listen and just as he did at the time feel his journey was coming to an end, so do I feel like the journey with Sam is also coming to the end but life always gives surprises along the way and can't wait to listen to the next book tortillas to totems. loved it... couldn't put it down... great job same.. I waited for the third book to come out in Audible format and was not disappointed. They are very well read by the author. The adventures and friends made on the road makes for a very good listen.